This Wednesday's short story is The Watershed by Rosamunde Pilcher from a collection called Flowers In The Rain & Other Stories. The book was published in 1991, and the The Watershed was published as "The Anniversary Surprise" in Redbook, February 1990. She finds herself interested in a house whose owner has just died. It is smaller than her country home, with a 'strip of garden' which would be simple to take care of. It is in the village so she could easily do her shopping and errands. But she knows her husband will not want to move. He inherited Hill House, and has lived there his entire life. She walks around her house that was 'always too big for us, even with the three children living at home,' full of wonderful memories of dinners in the dining room which is now rarely used. The house was a monument to family life. To a family of children who were children no longer. How had the years swept by so swiftly? If your children are grown you will know this particular feeling, and if they aren't you will know it one day. Edwina is restless, uneasy, wondering what the years ahead will bring. The ending is most satisfactory, offering Edwina a view of a different, yet happy and hopeful future. The story is filled with the description which Rosamunde Pilcher is so well-known for. Edwina knew the house. Had known Mrs. Titchfield for years. Had sometimes called to collect a pie for the church sale, or to deliver a Christmas card and a fruit-cake, and be asked indoors to sit by the fire with a cup of tea. Parking the car in the stable yard, Edwina carried the groceries indoors. The kitchen was huge and homey, with a dresser stacked with ironstone china, a basket of laundry waiting to be ironed, and the two Labradors waiting to be taken for a walk. I began reading Rosamunde Pilcher's work more than twenty years ago, and there is still no one who can touch her for telling a good story, with real people, and the most wonderful details which place the reader in a particular room (so often a great kitchen!) or out in the countryside. She will be 87 next month, and though she doesn't have a web page her son Robin does, and occasionally writes about his mother. It occurs to me that what I love best about Gladys Taber's writing are her digressions. Her chapter may be called 'August' but her thoughts are not confined in any way to that topic. She fully enjoys the month but it is a jumping off place for the rest of her ruminations. It is a very conversational style which is most appealing. She could easily be sitting in a cozy room with the reader. "Tried to call," he wrote, "line busy. Company stayed late. Car refused to start, and ducks caused accident. Will be over Thursday. Joe." Trying to decide how the ducks caused an accident took our minds right off the state of the yard. It is probably a mystery that we shall never clear up, a kind of James Thurber situation. Isn't that delightful? Her sense of humor is light and subtle, and ever pleasant to me. … if he were to live alone in the bee-loud glade, I wonder what he would do with nine bean rows? Maybe they were very short rows? Or maybe the faery folk would gather in the bright of the moon to pick and eat beans? Otherwise, I think Mr. Yeats would have had little time for his golden singing, at least in summer. He would just pick beans! And as a yellow pole bean grower, I know how true this is. I'm the only one who eats them and I simply cannot keep up. I finally say uncle, and let them grow to huge sizes and admire their bright yellow color as I might a flower. What someone has called my gentle philosophy of living comes from the warm sense of good there is around me. I can read the direst news in the papers and then go down the road and find some man or woman doing a very fine sacrificial deed for someone else. I think of George with a twenty-four hour day, taking on the chores of a neighbor who has illness in his family and thinking nothing at all of so doing. She offers cheering words that resonate in our time as well as hers. Democracy always seems to move ahead crabwise which is backward and yet goes ahead, too. The little crabs I see on the beach when we go to Cape Cod seem always to go in the wrong direction and then suddenly there they are. I think we operate in much the same way, scuttling back and then sidling forward, and in the end, we are a little ahead of where we were before. Jill takes up the latest Josephine Tey book, and I pop off with a glass of milk and Dylan Thomas' Quite Early In The Morning. A great part of Rachel Peden's August entry is to do with fairs. This is his [her husband's] idea of the farmer's perfect vacation: your own county fair all week, preferably with some good cattle exhibited; one or two days at fairs in all the counties you have lived in before; one or two in counties where you have good friends exhibiting; a few at fairs that offer outstanding horse pulls or tractor pulls; then two or three at your state fair; and around Thanksgiving, a day and a night at the International Livestock Show in Chicago. What more could a farmer want? Just this: "One evening this week I want to see our county fair with you." I've written about our local fair twice over the years of the blog. Last year's is here, and an earlier entry is here which includes a wonderful poem by Auden. Our day at the fair could be in either August or September, depending on when Labor Day falls that year, for it is always, always held over the Labor Day weekend. You can count on it like the dawning of the day. I wanted to see the flowers, the handmade rugs, the lovely serene quilts hanging from their racks, and the incredible things people crochet. Much of the handicraft is pure lavishment of imagination, with no hampering of function or beauty. Much of it, surely, is put together merely to show that anything can be used in some way, and much of it deserves a ribbon for proving this. In the various books of Gladys Taber which I have read over the years I've found that they often follow a year. But that year doesn't always begin in January. Sometimes a book begins in winter. Another might begin in November, and still another in spring. This first book I've read by Rachel Peden begins in September, and ends this month. And of all beginnings and endings, this seems most appropriate for me. I don't know if it is the lifetime of school beginnings, or the feeling in the air, but my personal year seems to begin in September. I feel alive, and hopeful, and energetic just as most of us are thought to feel in the spring. Spring, however, is almost too much for me; too much to plan, too much to do. I feel so scattered that it is always hard for me to settle on an activity with the concentration and steadfastness which only September offers. So for me, as in Rural Free, the year truly does end in August. It feels like the culmination of the year's activities, both mental and physical. The sun comes now at a slanting angle; early mornings are marked by an almost springlike excitement, as if the year might go backwards and return to September by way of spring. It is the end of August, the end of summer, the end of a book. But it is not really the end of a year, because a year is not really a circle. It is a segment on a spiral that repeats the same pattern year after year, but never quite identically, and never comes together in a final and hidden meeting place as a circle would. The year is life itself, forever changing, forever leading on to something else. In each year we look for cherished and familiar landmarks, and in finding these, we discover the necessity of the suffering the year exacts, the discipline it imposes, as well as the generosities it pours out to us. We do not know where the curving, spiraled pattern leads, nor in fact whether it leads up or down. We know only that someplace on it there is an assignment for even the least among us, and that the fulfillment of that assignment is important to the pattern and ennobling to the individual. I doubt that any philosopher of great reputation has ever said it so well, and so understandably. When I began this adventure I wasn't sure about how it would work. As the months have gone on, I've found a rhythm that seems to suit me. I sit down toward the end of the month with both books beside me. I begin alphabetically by first name, and also because I have 'known' her longer, with Gladys. I then come to the computer and write about her month. I go sit down again, and read what Rachel has to say, and come back to the computer. It feels right to read the month as mine is ending. This is such a joyful experience for me. They were both wonderful, intelligent, thoughtful women who wrote so very well about their world and the world. 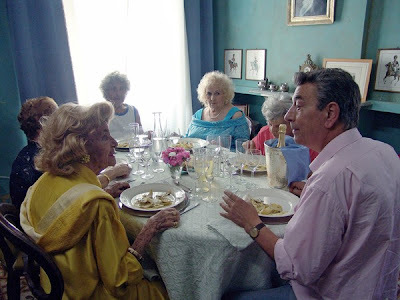 Mid-August Lunch (Pranzo di Ferragosto) opens with Gianni reading The Three Musketeers aloud to his mother, Valeria. They converse a bit about it, and soon she falls asleep. Gianni's kindness, the gentleness of his response to her questions, and the deep contentment on her face show the viewer a kind of love which is rarely seen in a movie. We don't know what Gianni did before, but what he does now is take care of his mother. I wasn't exactly sure of the living situation but it seemed like they live in a condo, but not what we Americans think of as a condo. It has the look of a simple, somewhat shabby apartment. When the manager comes by, we learn that Gianni is way behind on his fees. But there is an alternative. He will forgive the debt if Gianni will take care of his mother, Marina for the weekend. Naturally, Gianni agrees. When he brings Marina, he also drops off her sister, Maria. And while Gianni is figuring out arrangements, his doctor shows up offering medical care (for a slight heart ailment) in return for Gianni taking care of his mother for couple days. So there is Gianni taking care of four elderly women. It seems they know one another, but only slightly. It also appears that these women are mostly housebound in their own homes, and that this weekend is a big adventure for them all. Gianni is run off his feet cooking meals, making sure each one is comfortable, keeping his mother happy, moving the little tv from room to room, and chasing after one of them who has taken off without telling him. Gianni is rarely seen without a glass of wine or a cigarette, and lord knows the man deserves them! Gianni is a wonderful cook. He creates little masterpieces in his kitchen which has no granite counters or fancy cabinets or appliances. 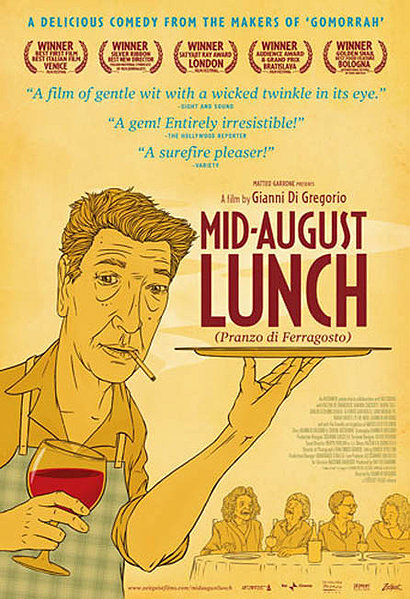 August 15 - Ferragosto or Assumption Day, is a national holiday in Italy, and the lunch Gianni makes, with the help of his friend, Viking is the centerpiece of the film. By the end of the film, these women have become fast friends, and are reluctant to go back to their former lives. I like to think that this celebratory lunch was only the first in a long line of get-togethers provided by, of course, Gianni. 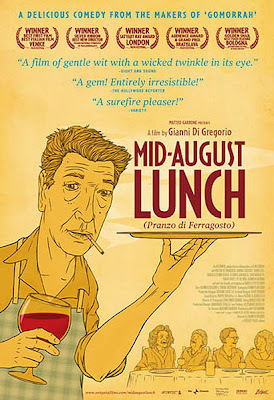 I saw this movie last summer at our little small town theatre, and just recently watched it again on Netflix instant. It is also available on dvd. I may buy a copy for myself because I love it so much. I've never seen anything quite as joyful and kindly. Mid-August Lunch is my offering for this week's Weekend Cooking. Please visit Beth Fish Reads for more writings on food related topics, and perhaps join in yourself. Addendum: I just came upon a nice interview with the man who plays Gianni, (and who is also the director), here. I have decided to join a weekly short story group. As you may remember, I used to post occasionally on Short Story Monday, hosted by The Book Mine Set, but it became clear over time that Mondays don't work for me. When I saw this button today on the From Kafka to Kindergarten blog, I clicked and arrived at Bread Crumb Reads the host for this event. I think maybe Wednesdays will work out better for me to read one and post about it. I love short stories, but sadly just don't take the time away from my other reading to read them. 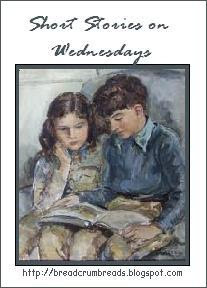 Short Stories on Wednesdays may be just the prompt to encourage me. We'll see what happens, but for now I am quite excited about this. Plus, I love the button, don't you? I'm beginning this new adventure with a short story by Virginia Woolf from a collection called Monday or Tuesday which was a most generous and kindly gift from a fellow blogger, Jeff and his wife, Janet. The story is called A Society and it has the most amazing premise, especially for one who loves to read. Poll's father left her a 'fortune in his will, but on condition that she read all the books in the London Library.' We readers might think this is an easy way to become rich, but on reflection it could be more troublesome than we at first realize. What genres do you absolutely hate? If the only books were of that genre, you might not ever read. This stipulation in the will could turn out to be horrible - like the worst literature class ever. After this promising premise, the story went off in a different direction. What I thought was going to be about books and reading turned into a discussion about men and women among this small group of women friends. After Poll read them passages that seemed ridiculous, they began to ponder the genius of men. They had always assumed that women bore children and men wrote books. The quality of the written works gave them pause. Has it been a waste of time for women to bring such creatures as men into the world? They each go off to a different male bastion - the Navy, Cambridge and Oxford, etc. - to see what successes, what progress has been made. After five years time, they come together to talk over their findings. "I have read new books pretty steadily for the past five years," said she. "Mr. Wells is the most popular living writer; then comes Mr. Arnold Bennett; then Mr. Compton Mackenzie: Mr. McKenna and Mr. Walpole may be bracketed together." If I spent some time, I'm sure I could find Virginia Woolf's opinion of them all. "Now no woman has ever been an artist, has she, Poll?" "JaneAusten-CharlotteBronte-GeorgeEliot," cried Poll, like a man crying muffins in a back street. I fear there are still little pockets of men in the higher echelons of education who believe these are the only women writers of quality. And here may be the saddest thing about the little story - that some ninety years on, this state of mind still exists. A Society may be read in its entirety here. I found it unsettling, and I think I may have to read it a few times before I can grasp what Virginia is really saying. There's an interesting and well-written interpretation of this story here. And please do read the comment as well because it offers another view. 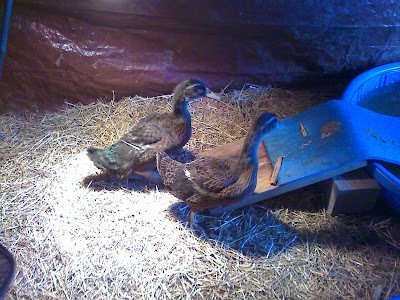 I thought you might enjoy a little update on the ducks down at Matt and Margaret's. If you are a new reader of my letters, and want to know more about our daughter and her boyfriend's house, you may scroll down until you reach 'letter topics.' Click on the one called The Making of a Home. The postings are in reverse order - new to old. The last time I wrote about the ducks it was June with the whole summer ahead. Today the sun has gone into Virgo, the last astrological sign of summer. In a month's time it shall be autumn. Matt and Margaret went to Bar Harbor, Maine on vacation the end of June and Tom and I babysat the ducks, draining out the water in their cellar pool and filling it up again once a day. They would get so excited when the fresh water was added. These two photos taken with my cell phone. As soon as Margaret and Matt came home, they went to work on putting up fence around the outdoor enclosure. With all the rain we'd had, that whole area was quite full of water. When the drier weather hit a few weeks ago, the water disappeared, but now is back again. 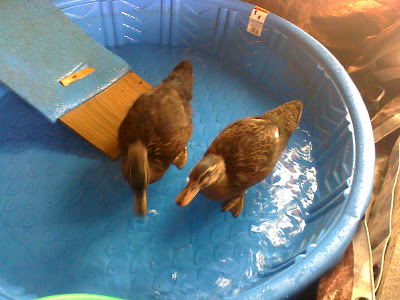 The ducks have their 'in-house' baby pool for when there's no water to swim around in. The tarp is to keep out the heat of the sun. There are plans for winterizing. It's a little glade in there. I just love it, and can't imagine a better place for duckies. Looking back toward the enclosure - you can see they have quite a large space in which to roam and swim. Lots of little places to explore. The big news is that now they've grown up enough, we can tell there is a male and a female, a drake and a duck. The drake has a green head, a white ring around the neck, and that little curled up duck tail feather. This means that when the duck lays eggs, if they aren't picked up, they will hatch into baby ducklings. That's the story with chickens too. All hens lay eggs. If there is a rooster, then the eggs are fertilized eggs. If those eggs aren't collected, they will hatch into baby chicks. They followed me as I left, and went in to have a little lunch. There's more on Rouen ducks here, and some photos here. They are the sweetest creatures; very friendly and cheery. When I walked back to the house there were dear Piglet and Lexi waiting for me to let them in. For a while now, I've been reading the Mystery Lovers' Kitchen blog, and recently I entered a contest to win the latest book in the Coffeehouse series by one of the blog's writers, Cleo Coyle. I thought I'd read the first in the series and bought it for my Kindle. This is one of the best starts to a cozy mystery series I've come across. Interesting, informative about coffee, good main character who didn't get herself into bad situations, and a fine mystery. Who could ask for more? And guess what, I won the book! Clare Cosi used to be the manager of The Village Blend coffeehouse, but left the job and the city for the suburbs, a marriage, and a daughter. The marriage has broken up, the daughter has grown up and moved to the city, and Clare has been re-hired as the manager of the Blend by its owner, 'Madame.' She has been offered the apartment upstairs so has sold her house and moved back. And there's an interesting twist. Madame Dreyfus Allegro Dubois is Clare's ex-mother-in-law. They've always been great friends so this is not a problem. The problem is that Matteo 'Matt' Allegro, the son of Madame and Clare's former husband, is going to share the apartment when he comes back from coffee buying trips for a few days each month. From the first moment when Clare finds Matt in the apartment, the reader sees that there is still a lot of emotion between them. The breakup was caused by Matt's extra-marital affairs. Though she is naturally still annoyed and saddened, she is also still a little bit in love with him still and yet, will try her best to not get pulled back in to the relationship. They mostly get along, and are both very close to their daughter, Joy. This is a modern family that is making its way without a guidebook, and mostly it is working pretty well. The Village Blend is a coffeehouse in Greenwich Village, New York City. Situated on a quiet corner of Hudson Street, in the first two floors of a four-story red brick townhouse, the Blend had been sending her rich, earthy aroma of freshly brewed coffee into the winding lanes of Greenwich Village for over one hundred years. The historic streets surrounding the place had once felt the footsteps of Mark Twain, e.e. cummings, Willa Cather, Theodore Dreiser, Edward Albee, Jackson Pollack, and countless musicians, poets, painters, and politicians who'd influenced American and world culture. Within a few blocks sat the Commerce Street home where Washington Irving wrote Sleepy Hollow; the historic church of St. Luke in the Field, whose founding vestryman, Clement Moore, composed 'Twas the Night Before Christmas; and the off-Broadway Cherry Lane Theater, which was started in the 1920s by a group that included poet Edna St. Vincent Millay and decades later employed a young usher by the name of Barbra Streisand. Well, with a description like this early on in the book, can you understand why I became excited about this series? Great description, setting, and writing are the hallmarks of On What Grounds. The mystery is a good one as well. A young employee who is also a dancer is found by Clare at the bottom of the basement stairs. The police are quite sure it was an accident but Clare feels that it could be attempted murder. While Anabelle lies in the hospital, her life waning away, Clare races to discover what really happened. I'll just say that I've never been so enthralled by a first book in a cozy mystery series as I am by this one. Clare is a wonderful character, a woman you'd like to have as a friend. The rest of her family are just as enchanting and the reader quickly cares about each of them. The workers and clientele have smaller roles but are still strong and memorable characters. The policeman, Lieutenant Quinn who comes to investigate is an interesting and appealing fellow, and I wonder if he will be the investigating officer in the other books. All of these factors would be enough for this reader, but there is more. This book is full of information about coffee; different kinds, ways of brewing, historical notes. I was fascinated. I'm not a huge coffee drinker. I have one cup in the morning. I drink it with no sugar, no milk, not black but with an almost equal amount of honey. No, I don't know anyone else who drinks it this way either. Here's one of those 'who knew' informative moments in the book. Take the great Kona scandal of 1996. A cabal of coffee producers, one of whom Madame had known rather well, had been caught rebagging cheaper Central American blends and transshipping them through Hawaii marked as that exceptional bean, Kona - ironically mellow for something grown in volcanic lava. As far as anyone knows, at least at this writing, Madame's friend is still in federal prison. If I were a movie critic, I'd say two thumbs way up for On What Grounds. The book is intelligent and fun, informative with a touch of romance. I've already bought the second one and I have an idea I might read right through the series. The website is a terrific companion to the books. It is filled with recipes, coffee tips, contests, and real coffeeshops. You could spend a lot of fun time there. 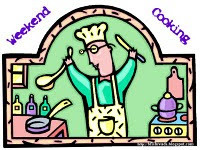 And the Mystery Lovers' Kitchen blog includes many other writers whose work I am eager to read. 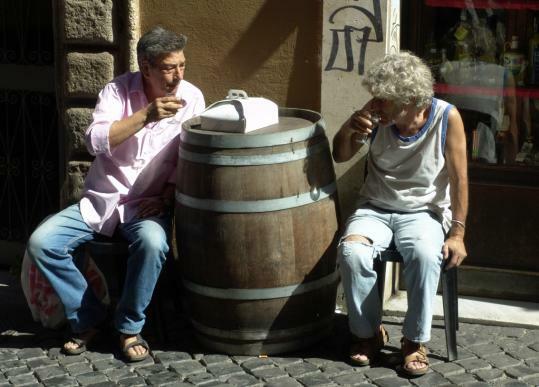 The Coffeehouse series is written by a wife and husband team, Alice Alfonsi and Marc Cerasini. 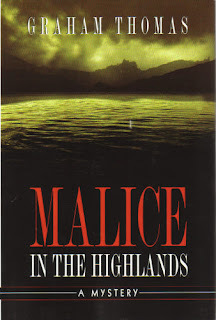 Alice Alfonsi also writes under the name Rosemary Grace, as well as writing The Haunted Bookshop Mysteries with her husband, as Alice Kimberly. Here's a video from last summer. This is my eighth book for the Foodie's Reading Challenge. There are many great reviews of food related books from several genres which you may read here. And because it is the weekend, and because coffee is a 'food' I am offering this post as a Weekend Cooking entry. You may read this weekend's postings here. 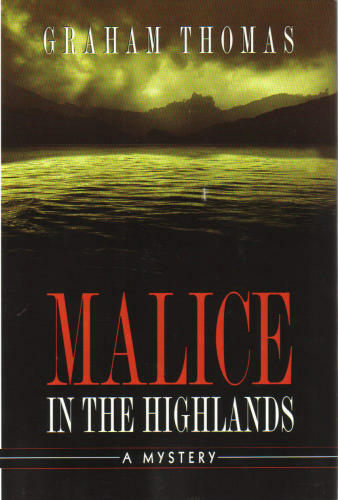 Since I've been buying books for my Kindle, Amazon has been recommending Malice in the Highlands. I recalled reading it years ago and not caring for it very much, so I have resisted. But one day I decided to give it another try. I still didn't love it to pieces, but I did find it a pleasant read, and am interested enough in the sleuth to go on with the series. Detective Chief Superintendent Erskine Powell is on his annual fishing vacation in Scotland. He is somewhat burnt out from his job which has changed as he has risen through the ranks. He now spends more time 'mired in the administrative morass' than apprehending criminals. He always stays at the Salar Lodge Hotel which has fishing rights on the River Spey. He gets a letter from an old school friend who is a bit down on his luck and Powell invites him to spend some time at the Lodge. Very soon a body is found in the river, and it turns out to be the new owner of the local estate, a wealthy Canadian. Thus, does Powell's vacation end. He now devotes his time to solving the crime. The facets I didn't like when I read the book before still didn't appeal to me. I'm not the least bit interested in fishing. Nor am I interested in the business affairs of the man who ends up murdered. But still, I did like Mr. Powell, and I found the other characters well-drawn. The mystery held my interest, and as noted, I shall probably continue on with the series, which is only five books. The last one was published nine years ago so it doesn't seem like there will be any more. And here, from the Agatha Christie Companion is the information about it if you are interested. Click photo to see it more clearly. This is an example of why I love this book so much. The authors bring the time and setting of a book to life for the reader. And there is even a timetable. The killer must be someone on the plane. 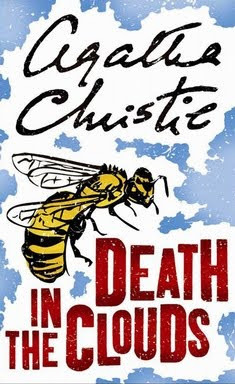 The plot is ingenious, the story quite involved, and the surprising culprit made this an excellent Agatha Christie mystery. This recipe comes from the May issue of Country Living Magazine. It is quite similar to two I've posted before, Garlic Roasted New Potatoes and Oven Fries a la Nicole. The main difference is that it uses butter instead of olive oil. I know, I know olive oil is a healthier choice, but once in a while it's okay to use butter instead. In a large baking pan, toss potatoes and 4 tablespoons melted butter together. Stir in parsley. Remove pan from heat and set aside. Transfer potatoes to a serving dish, Pour garlic-butter mixture over potatoes and gently toss to mix. The amounts of all ingredients are really up to the cook, depending on how many you are serving. This is a fantastic dish. I think perhaps we are a bit afraid to read about older people or see them in movies because they remind us of what lies ahead. If they are lonely or sad, we tend to think this is because they are old. But really, if we are honest, we must admit that we have been lonely and sad sometimes at any age. When we're forty, we look back at twenty-five as carefree and full of fun. But twenty-somethings aren't always happy either. We have worries and fears and grief at any age. If someone tries to tell you, oh, you don't want to read a book about an older widow named Emily, don't listen. It is exquisite in its portrayal of this eighty-year-old woman. I felt it to be a great privilege to spend time in her company, and when the book ended, I was sad to let her go. I wanted more of her daily life, thoughts, ideas, and feelings. I loved this book beyond words. I shall let some passages tell you more than I can in this book report. The character was introduced in an earlier book called Wish You Were Here, but you do not have to read it first. Because it mattered to me, I thought I'd let you dog lovers know that Emily's older dog, Rufus does not die, and she doesn't either! As Emily, a widow of several years is preparing to go out, she struggles a while to hitch her necklace. She remembers when her husband was alive. Over the years she and Henry had made a ceremony of the moment. There was no need to ask him. On formal occasions like tonight he would stand behind her like a valet, waiting for her to finish her makeup. She'd find him admiring her in the mirror, and while she discounted his adoration of her beauty - based, as it was, on a much younger woman - she also relied on it, and as time passed she was grateful for the restorative powers of his memory. No one else saw her the way he did. He knew the eighteen-year-old lifeguard she used to be, and the fashionable grad student, the coltish young mother. When he solved the clasp, he'd watch her regally settle the necklace on her chest, and then with his hands on her shoulders, bend down and kiss the side of her neck, making her close her eyes. That time of year which is so hard for many of us is described perfectly. The groundhog was wrong. Spring was at least six weeks away. Easter even longer. It was the dark time of year Emily dreaded, the promise of better weather a taunt as one dispiriting system after another swept across the Great Lakes. Snow, sleet, rain, fog. The sun came out every few days, and the slush melted, only to refreeze overnight, triggering pileups on the Parkway and making their hill impossible. Not even the Subaru could handle black ice, and instead of risking life and limb, she stayed in, the list on the refrigerator growing a second column. 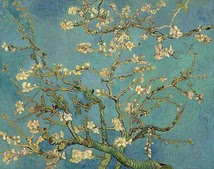 When she and her sister-in-law Arlene visit an art museum, Emily is moved by a Van Gogh painting, Almond Blossom. The flowers themselves did nothing for her, but the blue Van Gogh had chosen for the air captivated her - rich and bright, near aqua with a milky whiteness to it, a loudness which would have been laughable on the trim of a house and was nearly an affront here, yet from her first glance Emily couldn't look away. For months she'd been dreaming of spring. Here it was in all its gaudy freshness, made present through the plainest of emblems - a flower, a branch, the sun-warmed air. … How strange that his choice of color, made so long ago, was waiting to dispel her gloom at just that moment. And to think she'd felt it despite the chaos all around her [school field trips]. She couldn't imagine a greater testament to the power of art, and wasn't that why they were there, to have their faith in it renewed? For Emily, the real start of summer was marked not by Memorial Day and its poppies and parades, but the opening of her day lilies. They sprang up with the heat, their long stalks tilting over the driveway, their pumpkin-colored blooms facing the sun, a jubilant crowd welcoming her home. Her garden was in full riot, the alliums looming like pale blue moons above her phlox and sedums and gladioli. One border of Dalmation bellflowers hadn't quite filled in, but on the whole she was pleased. She spent hours hunched on her stool, communing with the elements, pruning and pinching in the hopes of even more glorious results. The sun rejuvenated her, her skin soaking in the vitamin D, and when the phone trilled in the kitchen, she let it ring. When I finished this book, I told Tom that it is among the very best I've ever read. Mr. Hercule Poirot, - You fancy yourself, don't you, at solving mysteries that are too difficult for our poor thick-headed British police? Let us see, Mr. Clever Poirot, just how clever you can be. Perhaps you'll find this nut too hard to crack. Look out for Andover, on the 21st of the month. And it turns out that yes, there was something, an ABC railway guide. Poirot is certain it was left on purpose because there are no fingerprints. An innocent man would have left prints - a guilty man would not. Dear Mr. Poirot, - Well, what about it? First game to me, I think. The Andover business went with a swing, didn't it? But the fun's only beginning. Let me draw your attention to Bexhill-on-Sea. Date, the 25th inst. What a merry time we are having! In the early hours of that day, a young woman named Betty Barnard is found dead on the beach. As you may imagine, this whole thing is awful for Poirot to be taunted in this manner, his whole being put into question, and awful for Hastings watching his old friend fail in apprehending the 'homicidal maniac.' Again, this gives the book a modern feel - a psychological battle between killer and sleuth. My trusty Agatha Christie, A Reader's Companion offers a photograph of a 1936 summer Railroad Guide. 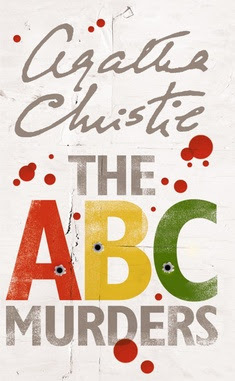 The ABC Murders is one of the best Agatha Christie books I've read. I was riveted by the mystery, and could not imagine how Hercule Poirot would ever be able to find this killer. I highly recommend it. A little note: as I was writing this book report, I had my Kindle beside me at the computer so I could quote some passages. When it turned off, there was Agatha's lovely face. I hope she knows how very, very much she is appreciated after all this time, and that her book from 1936 is still intriguing and interesting 75 years later. It is rare that a single new thing can change many, many aspects of one's life. That single new thing for me is high-speed internet. For years and years we have gotten online via Wild Blue Satellite, and while we were always grateful for the step-up from dial-up, it was still frustratingly slow, as well as costing almost $85 a month. The folks down on the main road have had Time Warner Cable for a long while but we weren't candidates for it because we live so far away -almost a quarter of a mile from the main line- and the cost would have been prohibitive. But an added surprise benefit to Margaret and Matt moving in down the road is that now there were poles in place that made it much less costly to string cable up to our house. So we split the cost (2/3 us and 1/3 them) and now both houses have this wonderful thing called high-speed internet. They got cable television as well, but since we already have DISH TV and are very happy with it, we just got the internet part. We have figured that our outlay of money will be paid back in about a year and a half. In addition, we bought Apple TV so that we can stream movies from Netflix right onto our tv screen. And boy, is that ever a little technological miracle to me. I click on a movie from my Instant queue, and I watch it. Amazing. In addition to the streaming, this little black box also allows us to get internet radio. There are a zillion stations out there offering every imaginable kind of music. And we get podcasts. And the NPR 'Little Desk Concerts.' And Tom hooked up our Bose radio so we get great sound. And we've gone back to something we tried a few years ago - putting the tv in the kitchen with a couple chairs. Our living room is now for sitting, visiting, and reading. It is a quiet, serene, inviting place to be. When people come over, they don't watch television. Just Tom and I do that. And in the winter, we will be roasty-toasty with the wood stove beside us. We won't have to turn on the oil heat nearly so much. These chairs may seem to be uncomfortable but they aren't. They are easy to sit in for long periods of time. The reading lamp is there for winter reading, too. Now, back to the internet advantages. I jotted down a page loading time to illustrate how much faster it is. As much as I love the site Cornflower Books I visited very rarely because it took so long to load. After high-speed: 39 seconds - 100 seconds less! When I used to write a blog post it would take so long to load pictures that I'd leave the computer and go do something else. Now they load in no time. We couldn't be more pleased with the whole arrangement. We feel that we are part of the 21st century now! You've seen this old maple tree often. It is about 150 years old. In 1998 it endured a 5-minute long tornado-like wind which tore off a big limb. We thought we'd have to cut it down, but it came back the next year and has thrived ever since. This morning I saw an odd flying movement from the fencepost just across the road over to the tree. We went out and found a newly-fledged robin just kind of sitting there, wondering at this new world.